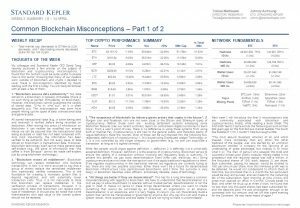 My colleague and Standard Kepler CEO David Tang recently authored a few articles on the subject of blockchain and cryptocurrency misconceptions. I found that the content could be quite useful to people new to this sector. Knowing that many of our readers work outside of blockchain and crypto I decided to cover these 8 misconceptions identified by David, starting with the first 4 today. You will likely be familiar with at least a few of them. 1. “Blockchain ensures data authenticity”: Yes, data stored on a blockchain is typically immutable (there is no such thing as perfect immutability on blockchain). However, the blockchain cannot guarantee the validity of stored data. “Cr*p in, cr*p out”, as it is often eloquently put. The misconception may stem from people mixing up two types of data: transactional data and general data. 2. “Blockchain erases all middlemen“: Blockchain technology can replace middlemen who facilitate transactions; in fact, it is more accurate to say that a group of miners replace the centralized middleman who traditionally verifies transactions. This is the foundation for creating a monetary system that is beyond regulations, and with potentially lower transaction costs. Thus, it is not inaccurate to state that blockchain can replace middlemen in the verification process of transactions. However, it is inaccurate to state that blockchain can replace every type of middleman. It should also be noted that some intermediaries who add value to the overall system should not be replaced. 3. “The acceptance of blockchain by industry giants proves that crypto is the future“: JP Morgan coin and Facebook coin are not even close to the Bitcoin and Ethereum types of cryptocurrency. Rather, these coins are existing settlement systems employing some blockchain features (see our recent summary report on central bank digital currencies to learn more). From a user’s point of view, there is no difference in using these systems from using Swift or WeChat Pay. Cryptocurrency is still new to the general public, and therefore plenty of vague definitions make the rounds. Most of these can be summarized into the following two, reasonable, definitions of cryptocurrency: 1. It is issued using Distributed Ledger Technology, or 2. It is not controlled by any single company or government (e.g., no one can stop/wipe a transaction as long as it is signed correctly). While few people would argue against definition 1, definition 2 is definitely not a universally accepted definition. However, definition 2 is the essence of cryptocurrency. Blockchain serves to ensure the validity of a transaction without involving any regulatory body or authority. To achieve this benefit, we pay extra decentralization costs (time cost, electricity, etc.) Using cryptocurrencies does not lower the transaction cost if we apply traditional regulations to them. If we regulate cryptocurrency in the traditional manner (as regulators are currently trying to do), there are only two possible outcomes: Either there won’t be a future for decentralized blockchain infrastructure (only permissioned blockchains, and I think this outcome is very likely), or blockchain becomes a less efficient, and already obsolete, piece of technology. 4. “All things are better if they are decentralized“: This has for a long time been a common misunderstanding with regards to blockchain. We have to understand that decentralization is a cost we pay to allow blockchains to operate without trusted parties; decentralization is not the goal in itself. It makes no sense to make things decentralized unless you want to create something that cannot be controlled by an individual, an organization, or an alliance. Decentralization is an expensive, and it is very fragile. In return, you can theoretically build a system that cannot be manipulated or governed by anyone. But why pay this cost and make a system slower, more expensive and less stable if we are not trying to make it uncontrollable?